Director Milos Forman sadly passed away last week, and as a tribute the Lighthouse is screening his Oscar winning 1984 film Amadeus. 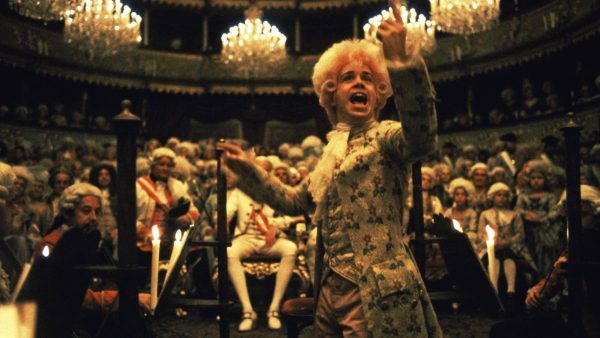 Focussing on the rivalry between composers Wolfgang Amadeus Mozart (Tom Hulce) and Antonio Salieri (F. Murray Abraham), it’s one of the most gripping period biopics ever made, and the music ain’t half bad either. Sergio Leone changed the western with his very operatic Italian takes on the genre. You can catch the first two installments of his ‘Dollars’ trilogy this week, with A Fistful of Dollars playing in the Lighthouse Friday and Sunday, and my favourite of the trilogy, For a Few Dollars More at the Irish Film Institute on Saturday. The best of the week’s new releases is a homegrown film, Dublin set zombie thriller The Cured. Set in the aftermath of a zombie outbreak where ‘cured’ zombies have been released back into the populace, the film plays as an allegory for attitudes to immigration. It degenerates into cliché in its final act but it’s compelling up to that point and boasts a slickness absent from most Irish horror movies. Juliette Binoche struggles to find a man in Let the Sunshine In, which automatically tells you what a load of nonsense it is. Cult director Claire Denis’ latest is one of those insufferable French movies in which a middle-aged protagonist seems to have no real world concerns beyond the satisfaction of their libido. Bel Powley is one of the more interesting young actresses working today, and she gives an impressive performance in Wildling as a teen freed from the house where she was held captive by a man claiming to be her father. The film fails to exploit her talents however and after an intriguing setup it lapses into Young Adult fantasy territory, playing out like a second rate Twilight knockoff.